Sindy was badly injured in a car accident in October 2004 in the age of two years and six months. She came to me two months after that. She had been operated and a metal plate was put in her right leg. There were fractures both in radius- and ulna-bones. It took many months her to recover. It seemed in the beginning that her leg won't be any better. Her legs healing were montly followed up radiographically by vet Tuomas Illukka in PetVet,Turku during the next six months. 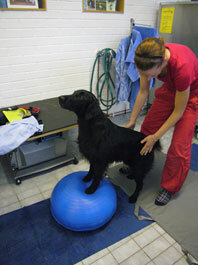 Animal physiotherapist Leena Piira started her montly treatment at the same time. Sindy was much better after her first visit to Leena. Sindy's anxiety and diagonal movements had gone. It seemed like a miracle. This treatment lasted till winter 2006. Niina Kreivilä took also her as a massager trainee patient in early 2005. She made her a trainer programme and massaged her muscles once a week. This treatment and the one Leena Piira gave to Sindy helped her muscles to recover. Sindy got the promise to move freely in early summer 2005. Upp till then we had to have had her in a leach, After 11 months inte autumn 2005, when the metal plate was removed, it started all again. Sindy had to minimize her physical exercise. Niina made a new programme in 2006. Sindy had the possibility to swim as much she wanted to during the summertime and move in snow in the winter. It helped her muscles to grow, but she kept limping after a heavy exertion. 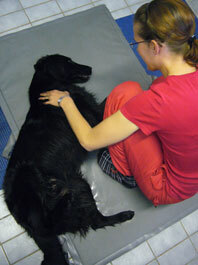 When Niina had her mother leave animal physiotherapist Tanja Kotti started with Sindy. Sindy had her weekly treatment during the spring 2007. 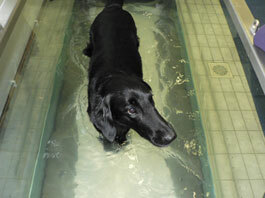 The water physiotherapy and massage made her leg so much better that she got her very first certificate in the spring 2007 and second one summer 2008 and the third one in October 2008 among 209 flatcoated retrievers in The Annual Finnish Retriever Special Show becoming Finnish show champion. 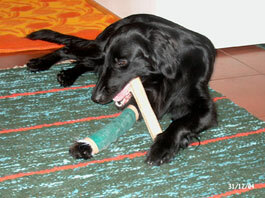 Sindy succeeded in the retriever field trials in may 2008, too. 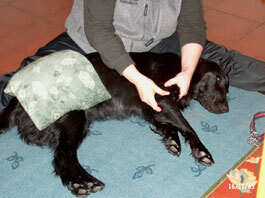 Sindy got 3 injections of Cartrophen in October 2007 which made her movements even better. The limping occurs only after a heavy exercise. We’ll have to keep in mind her leg is never like a healthy one, but it is now better we ever could imagine. Sindy moves freely and without pain. Thanks to Leena, Niina, Tanja and the staff in Pet Vet. Benita, her breeder, and Lotten, father Scott’s owner gave us the wisdom they had and all the support we needed. Akane, Kaija, Christina and the previous owner Marika and many others were with us in the moments of hesitation and despair. For the most: Thank you, Sindy, you did it!